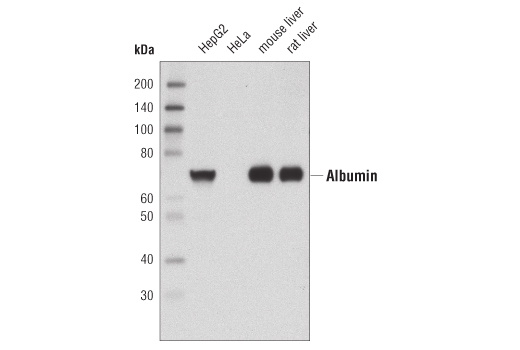 Western blot analysis of extracts from mouse and rat liver as well as HepG2 and HeLa cell extracts using Albumin Antibody. Albumin Antibody recognizes total human albumin protein. It does not recognize albumin from bovine or horse. Polyclonal antibodies are produced by immunizing animals with a synthetic peptide corresponding to residues surrounding Pro134 of human albumin. Antibodies are purified by protein A and peptide affinity chromatography. Serum albumin is the most abundant protein in plasma. It accounts for over 50% of total human plasma protein content, having a concentration of approximately 40 g/L. Albumin is predominantly synthesized in the liver and is a major transportation component for many endogenous and exogenous compounds, including fatty acids, steroid hormones, metabolites and drugs. It is also responsible for maintaining colloid osmotic pressure and may affect microvascular integrity (1).